I was sitting in the audience of a local Irish dance show at a small theater across the street from the Grand Ole Opry. My neighbor just started Irish dance lessons, and I was excited to see her on a big stage. As soon as the stage lights turned on, I was mesmerized. The dance number was titled “Dance Above the Rainbow,” and I sat at the edge of my seat, enviously watching girls my age twirl and leap in colorful capes across the stage. I quickly caught myself bouncing out of my chair and tapping my black dress shoes on the floor, making up my own beats to what I described as, “fairy music.” The dance was the most magical thing I had ever seen, and my mouth dropped as tears filled my eyes. I begged my parents to let me Irish dance. One evening, she took me to a Flamenco dance performance. “What did you think?” My mom asked when we arrived home. I shrugged, placing a 1995 Riverdance tape into the VCR. After a year or so of begging, my parents finally let me Irish dance. Every Tuesday and Thursday night, my parents drove 45 minutes in rush hour traffic to drop me off at my 2-hour dance class. I loved that beautiful, loud blend of the accordion and fiddle, which blared from the speakers as I walked through the doors of the studio. The music excited me as I laced up my soft black leather dance shoes (ghillies) and stretched for warm ups with fellow beginner dancers. Sweat dripped from our foreheads to our necks as we took turns practicing steps over and over again. My happy heart felt as though it would burst out of my chest as I tried to jump higher and higher. “There goes Tigger!” My dance teacher Ms. Mary joked as I sprung into the air. We danced with our arms taped to our sides (sometimes literally), legs locked, and toes pointed. “Kick! Move! Lift! Straight arms, ladies!” Ms. Mary yelled. Toward the end of practice, the advanced dancers arrived for competition class. My friend Lily and I gazed at them, as they were celebrities to us. Their bright white poodle socks, scrunched to their ankles from nonstop dancing, accentuated their bulging, perfect calf muscles. As the advanced dancers prepared for class, they stood next to Ms. Mary and observed us, often offering dance advice. At the end of class, my dad spoiled me with a milkshake, and I rode home dreaming of competing at Nationals or Worlds and being as graceful and accomplished as them. When I wasn’t at dance class, I practiced everywhere: grocery store, playground, and even in science class. “Catie, stop fidgeting!” My science teacher would hiss as I tapped my fingers on the desk to practice my new steps. During math tests, I would quickly move my feet around under the table. It was very obvious, even to my peers, that I was more focused on improving at dance class than I was on solving any math equation. On the way home from school, I listened to Irish music, which drove my siblings absolutely crazy. At home, I practiced in front of a full-length mirror and on a 6 ft. x 6 ft. plank of plywood my dad placed for me in the garage. Eventually we turned the attic into a mini dance studio for me, and I would dance until my family barked at me for making too much noise in my hard shoes. As I continued to improve, many weekends were spent traveling to competitions (feises) held in nice hotels. My mom would drive to feises in Georgia, Louisiana, Alabama, and my siblings were forced to tag along. The night before my first competition, I practiced alone in the hotel room, and Ms. Mary checked to see how I was feeling. The unavoidable nervousness and curlers my mom placed tightly in my hair resulted in very little sleep. Early the following morning, I put on my beginner uniform, which was a plain white short-sleeve blouse worn with a simple black skirt and tights. I walked down to the hotel lobby to check-in for my first competition. What was once a normal, functioning hotel the evening before had transformed into a jungle buzzing with anxious preteens in tank tops, soffe shorts, and curly wigs resembling Shirley Temple. An overwhelming stench of hairspray filled the air, and not even my CD walkman on the highest volume could drown out the high-pitch squeals of girls who fake hugged “frenemies” from other dance schools. I sat in a conference room with Ms. Mary and waited for my age group to be called. I looked down at the number pinned to my skirt as I stood in a line with twenty or more girls who changed from hot pink tank tops to their hot pink sparkly dresses. When it was finally my turn to walk on stage, I smile at the judges. At the corner of the stage was an accordion player, and when he started to play, I danced to the best of my ability. That day I competed in one category (jig) and won a third place medal. My very first medal. After a few competitions, I graduated from the beginner uniform and received my official school dress. No longer did I have to sleep with hair in curlers before a competition, as I ordered my own wig in the perfect shade of black. Emily, one of the advanced dancers, taught me how to wear it. She even demonstrated how to use sock glue on my very own bright white poodle socks so they wouldn’t fall down at competitions. In my mind, I had finally made it. I danced throughout middle school and high school, traveling to regional competitions for solo and group dances, known as “ceili”. After years of practices and feises, I advanced from beginner to novice/prizewinner grade, competing in five to six different dances which included reel, slip jig, hornpipe, treble jig, and more. Although familiar and comfortable with feis world, emotions were always high whenever my friends and I received our scores. After we danced, we stood in a small, crowded conference room in our tank tops, soffe shorts, and Crocs, scanning a wall of numbers to see if we recalled, meaning we placed in the top half. I blushed as I walked down hotel hallways with three, four, or even five 1st place medals. My name would be engraved on the back of the medals, and I’d come home with a handful of trophies beside me in the backseat of the mini van. I loved performing. I loved spending time with friends at class. I loved learning new steps. 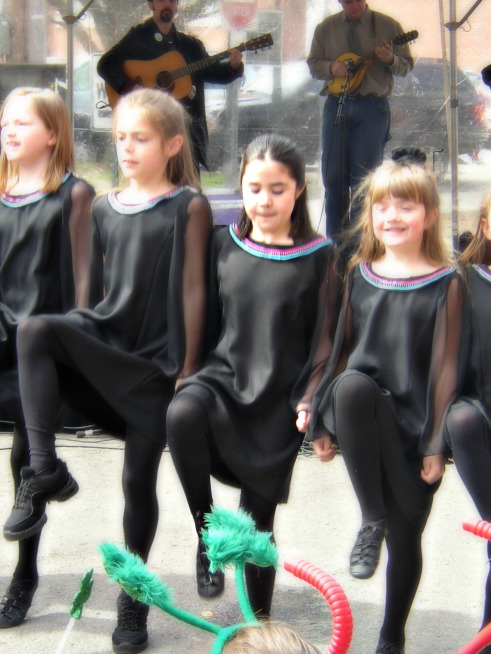 But the more advanced I became, the more I found myself trapped in an Irish dance version of Toddlers in Tiaras. Little girls used self-tanner on their legs, wore an exaggerated amount of makeup, and strutted in an extravagant solo dresses that I’m pretty sure put a number of families into bankruptcy. I would assume that for many children, there comes a time when the focus of why he or she does an after-school activity gets a little hazy. 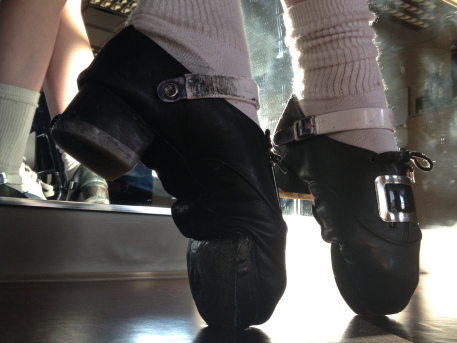 I wasn’t dancing for scholarships – or at the time, simply because it made me happy. Because I wasn’t as happy as I had once been. Perhaps I forgot why I wanted to dance in the first place – which was to fly. St. Patrick’s Day is one of my favorite holidays as I remember the shows and festivals performed with friends, and an audience dressed in green, clapping along off beat. After all those years of watching the Riverdance VHS tape, I finally saw Riverdance in person, sitting at the edge of my chair with tears rolling down my face like that little girl I once was in total awe of the beauty on the stage. On my honeymoon in Ireland, I brought my ghillies so I could dance a jig on Irish soil at the gardens of Powerscourt Estate. I even danced at a pub with an Irish band while on a Disney Cruise. And in those little, far apart moments – I fly.